On our way to dinner a few weeks back we passed by a large well-lit cafe on the bustling avenue Roosevelt which we added to our list of new places to try out. Last Sunday, after brunch at another new discovery in Condado (more on that later), we headed over to Puerto Nuevo to see what they had to offer. 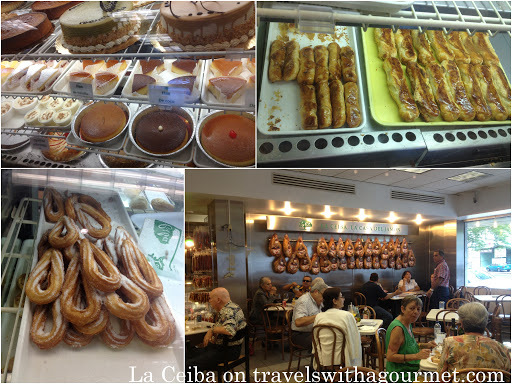 La Ceiba is a large delicatessen and pastry shop specializing in Spanish treats from jamon and chorizo to churros and turron. A large chiller counter lines one whole wall and is filled with goodies – cakes, pastries, sweets and bread while a small area off to the side has prepared food – boquerones en vinagre (white anchovies marinated in vinegar), seafood paella, chorizos stewed in red wine and lots of other goodies. There are also sandwiches made with jamon serrano and other Spanish cold cuts. The cafe itself is more a self-serve cafeteria with simple formica topped tables and wooden chairs where one can have breakfast, lunch, dinner or a snack as the place is open all day from early in the morning to late in the evening. It was bustling for a Sunday afternoon with locals lingering over lunch or just having a beer, some ham and watching Spanish football on the large-screen tv’s. We succumbed to a few sweets to go – mallorca, churros, quesitos (a caramelized puff-pasty case stuffed with white cheese) as well as a few salty treats – a togo box of crispy roasted pig crackling and a small portion of seafood paella. La Ceiba is perfect for a simple Spanish meal or a coffee and a pastry with a bit of local flavor thrown in. *Open all-day everyday from 6:00 a.m. to 9:00 p.m.